​The class at the Jericho residence is tailored to the physical and emotional needs of the young women who live there together, all of whom had 2 year olds at the time of this Karma Project. The goal is to support the mothers in their journey to care for their children and themselves with confidence, peace and love. 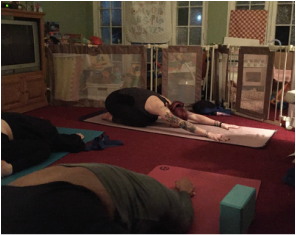 Jenna offers asana to help strengthen the young mothers post-partum bodies, as well as to help them gain tools for relaxation and stress relief. As someone who has always been an advocate for health and fitness, Jenna initially approached yoga as a means of physical exercise. It was not long before she discovered the deeper benefits of yoga, and realized the spiritual journey she had unknowingly embarked on. Within her first year of practicing, Jenna decided to deepen her own practice by taking her 200 Hour Yoga Teacher Training at Breathe N Flow in 2014. 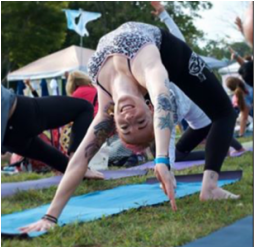 Upon graduating, she soon realized that her true calling was to share the benefits of yoga with others and began teaching right away.